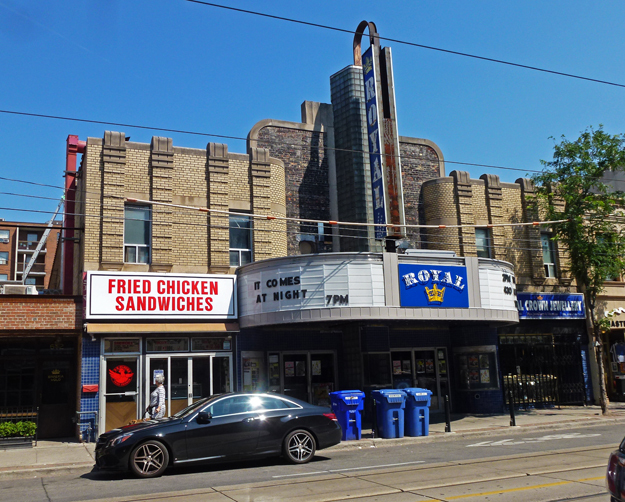 I first showed you the Royal Cinema in Little Italy back in 2011 (HERE) and was down on College St for a Sunday brunch recently and took another pic. There have been a few changes such as the marquee being redone but overall it still retains its 1939 Art Deco glory. And it is still functioning as a movie theatre! Taking part in Signs, Signs. Click HERE to see more signs from around the world. Wonderful blast from the past. It is amazing it has lasted into the digital age. We have a similar Art Deco theatre in our neigbohood, too. Aren't we lucky to have these few remaining theatres still around and functioning? Hello, it is a great sign. It is great that it is still a theatre. Enjoy your day! It's such a great looking building. ...an Art Deco glory for sure. It is beautiful and FRIED CHICKEN SANDWICHES right next door. Though in Little Italy I would have expected a red sauce joint in that location! It is so good to see a building like this still in house and in good repair. Perhaps the fried chicken sandwiches next door had something to do with the theater's success? Delightful and especially wonderful that it's still showing films! It's great to see that this beauty is still standing and operating as it did decades ago. Love to see the inside. Wonderful to see this Art Deco theater still in operation. It is a jewel. I like the style of architecture. A grand building. Great to see that theatre in Art Deco and especially by showing it in bricks. Very good. "Meet Me At The Fountain"